A slum on the outskirts of Accra, Ghana, received major media attention in 2010 and 2011 when the outside world realized it was where computers go to die. In an area called Agbogbloshie, impoverished residents were burning broken electronic parts, discarded and dumped by wealthier nations, to extract the metal components. Crouched around bonfires, they inhaled toxic smoke and unwittingly leached heavy metals into a nearby river, just to eke out a living. Harvard undergraduate Rachel Field '12, an engineering sciences concentrator, read the news reports and devoted her senior thesis project to addressing the problem. "It had gotten so much attention before, but it was amazing to me that almost nobody was trying to actually help out or figure out a solution," she recalls. 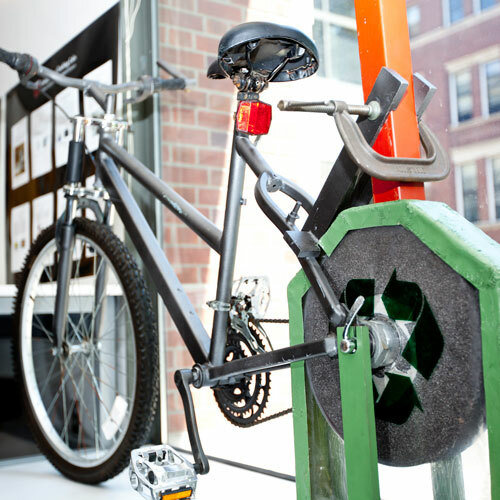 The result of her efforts is Bicyclean, a pedal-powered grindstone that pulverizes entire circuit boards inside a polycarbonate enclosure, capturing the dust. Though Field is now a year out of college, her project recently won the silver award at the Acer Foundation's Incredible Green Contest in Taiwan and was displayed for three days at COMPUTEX Taipei, one of the world's largest computer industry expositions. The $35,000 prize will enable her to return to Ghana to test a second-generation prototype and to seek non-profit status for the endeavor, a significant milestone in a project she was afraid might fall by the wayside after graduation. Captivated by the problem in her senior year, Field dove headfirst into her research. Supported by a grant from the Harvard Committee on African Studies, she traveled to Agbogbloshie in January 2012. "It really does look surreal," she says. "An otherworldly place. When I first got there, it was just completely shocking and unbelievable that people would expose themselves to this hazard. But, obviously, most of the people who work there are living in these slums that are right next to it." So she spent her month-long winter break meeting the community and observing their work. "I knew it was very important to the project that I see what was going on first hand, and that I really talk to people," she explains. "There was a phase where I had this vision of building something like those emergency trailers that go out after big storms, but with a little chemical lab in it. Of course, once I went there, I realized that would make no sense. "What's interesting, though, is that a lot of guys there know how to weld. There are a lot of very talented craftsmen, because they're already using these types of skills to very expertly dismantle the electronics." A device that Ghanaians could actually assemble themselves might work well, she realized. All undergraduates pursuing the bachelor of science degree through the School of Engineering and Applied Sciences (SEAS) are required to complete a senior design project, known as ES 100, with the guidance of an experienced adviser. Design preceptor Joe Zinter and specialist Jordan Stephens helped Field to create a rational list of goals and constraints. "I thought, well, what do I not want them to do? I don't want people to be directly exposed to toxins, and if that's one of the parameters then I don't want people to have to use heat. I want this to be something that people can afford and build from materials that are already available to them." Bicycle parts are ubiquitous and universal, portable, relatively inexpensive, and—of course—human powered. Field had to learn how to weld, too, with help from Stan Cotreau, manager of the Physics/SEAS Instructional Instrument Lab. To quickly build the first prototype, she also used a laser cutter to fabricate the polycarbonate box, and strips of fiberglass to seal it properly. And she drew on the expertise of her advisers at SEAS to create a mechanically sound design and to model it in SolidWorks. "Jordan [Stephens] was great for the second half of the project, in terms of making the first prototype," she explains. "He basically told me, 'If you want to attach a grinding wheel to a bicycle and not have it fly off into someone's face, this is what you need to do.'" At the competition this June, she was up against a wide range of other "green" projects—2,100 of them, in all. The high-profile judges evaluated the entries on the basis of their "earth friendliness, reality friendliness, and innovation friendliness." Teams from around the world had interpreted those parameters to produce an impressive array of solutions to sustainability challenges. The Taiwanese team that won first prize offered a new way to cool a computer without using fans and using minimal electricity; other projects tackled oil spills, reduced waste in food supply chains, and improved public transportation for suburban areas. "If you listen to Rachel talk about her project, it always starts with, 'I traveled, I saw, I was affected, I was inspired,'" says Anas Chalah, director of the Instructional Laboratories and the Safety Program at SEAS, who has watched the project evolve over the course of two years. "It's not a trivial idea; it's a universal problem. It has the recycling element, the socioeconomic and budget element—making money out of waste—and it's environmentally friendly." Chalah kept Field's prototype on display in the teaching labs in 2012-13 to inspire the next class of seniors as they worked on their own thesis projects, so it was still available to her when she decided to enter it in the Incredible Green Contest. Stephens helped her to polish it up again and prepare for multiple rounds of interviews; he even traveled to Taipei to support her through her final presentation. "We don't close our doors when students graduate," remarks Chalah. Field has spent the past year in Paris, continuing work on a project she began in the SEAS course ES 20, "How to Create Things and Have Them Matter," taught by David Edwards, Gordon McKay Professor of the Practice of Biomedical Engineering. That project is decidedly more indulgent; Field and her collaborators have created an app that sends scents—real scents, like butterscotch or roses—from one user to another. Le Laboratoire, of which Edwards is founder and director, is currently hosting an exhibition—part art, part engineering—in which members of the public can sensuously experience virtual coffee using a small, handheld device called an OPHONE (for "olfactory phone") that connects to an Android phone via Bluetooth. "This is something I've been working on all year, and having random people from the public using it is just the best feeling," says Field. With the support she'll now receive from the Incredible Green Contest, Field may soon be able to advance the Bicyclean project to the same stage, and perhaps see it in action in Ghana. Her friends near Agbogbloshie have been sending her Facebook messages during the past year, asking when she might return. Immediately after the award ceremony, she was able to write back to them: "I just got funding." "I didn't ever want to be someone who just stopped by for a month, saying, 'Yeah, I'll totally help you out,' and then never show up again, so this is pretty exciting," she says. "When I got to send that message to them, it was a really good moment for me. At the end of the day, the site is still there, the problem's still there, and hopefully this is going to be part of the solution."